Montgomery County school officials are investigating who posted flyers stating "It's okay to be white" at a high school in Silver Spring. Ten of the fliers were found Wednesday morning. WASHINGTON — Flyers stating “It’s OK to be white” were found at Montgomery Blair High School in Silver Spring on Wednesday morning. The fliers were found on 10 exterior doors to the building by staff before students arrived, the letter states. “We are taking this seriously and are investigating this incident,” Johnson writes. 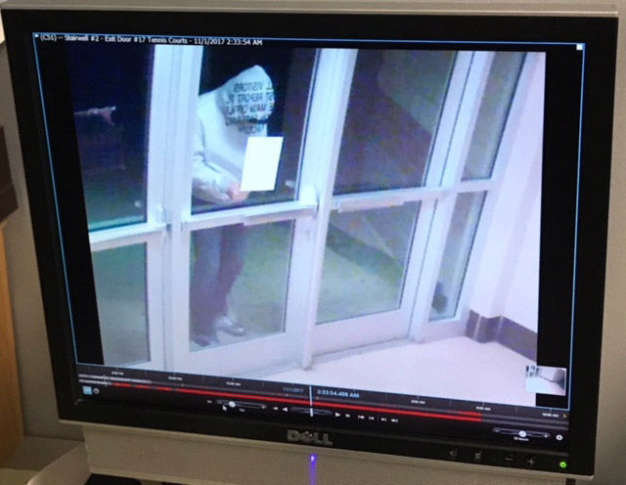 Security footage released by the school system shows a person in a hooded sweatshirt posting one of the fliers. And police have been contacted, a school spokesman said. The fliers seemed to be prompted by the 4chan message forum, according to school officials, that promotes racial and political tensions. An Alexandria man used the same forum to make threats to kill black students who attend Howard University. John E. Rust faces federal charges in that case, which sparked panic at the urban D.C. campus last month. A thread on the forum encouraged readers to post the same distinct fliers — and provided a sample that could be printed — at schools on Halloween. Conspirators were told to wear Halloween costumes as a disguise and were urged not to cause any vandalism. Similar signs were found in several other cities across the country this week.